Owling can be a great way to add elusive raptors to your life list, but this unique type of birding has special considerations for success. Understanding the basics of finding owls can help you go owling with great views of these elegant birds of prey. Owls are nocturnal birds, but that does not necessarily mean they can only be seen in the darkest hours of the night. Several owls, such as short-eared owls and snowy owls, are more active during the day than most other owl species. The best time of day to see owls is at dawn or dusk when these birds are more easily spotted and more active. A moonlit night can also be a great time for owling. It is after all when the moon provides more light for effective owl spotting. Most owls do not migrate and can be found in the same territory throughout the year, but certain times of year are better for owling. Searching for owls in late winter can be easy for birders who bird by ear when owls are calling more frequently to attract mates or claim their territories. Nesting owls are more elusive in early summer as they protect their nests. From mid-summer to early autumn can be ideal for owling, however, when young owls are first stretching their wings, and these younger birds may be less secretive and easier to spot. Study a field guide to learn which owl species you are likely to encounter. This can help you be familiar with these birds' preferred habitats, field markings, size and other clues for proper identification. 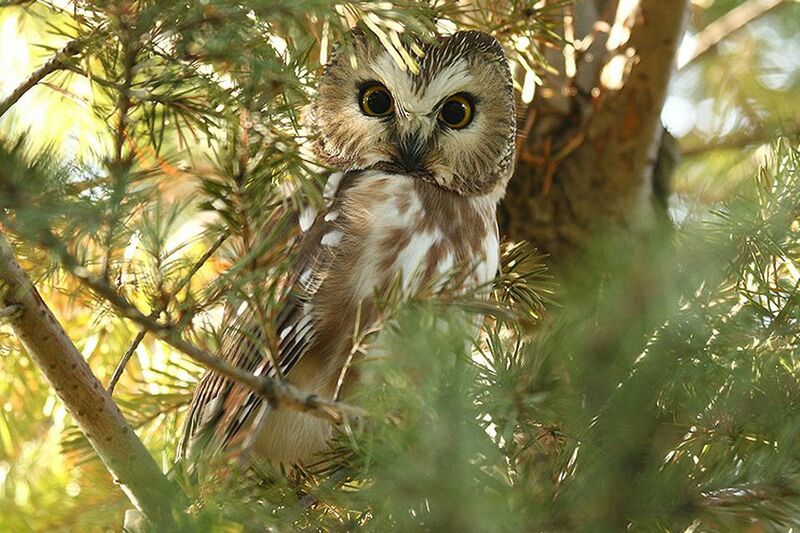 Research owl calls to be prepared for birding by ear. Many owls have distinctive calls, and listening carefully can not only help you identify the bird by sound, but can also help you locate the bird for the best view. Choose the proper optics. Birding binoculars with wider lenses to capture more light are the best option for seeing owls in low light conditions, and a spotting scope can be effective to watch a perched owl. Dress appropriately for the local weather, bearing in mind that temperatures can drop quickly after sunset. Choose non-reflective, quiet fabrics without metal fasteners that can reflect light to be as unobtrusive as possible to the birds. Darker colors and dark camouflage are the best options for what to wear out owling. Add appropriate nighttime supplies to your field bag, including a strong flashlight with extra batteries, insect repellant, and warm drinks if desired. Take a nap earlier in the day so you have enough energy for a late night of owling, without sapping your energy reserves to the point where it might be dangerous. You won't see owls effectively if you're stumbling sleepily along. All the preparation in the world cannot help you find owls if you don't know where to look for them. These raptors have large ranges but can be very loyal to productive hunting grounds, and if you know where owls have been seen recently, you will have a better chance of finding them yourself. Check online message lists, sightings reports or contact a local birding organization for tips on where to find owls. If there are no recent sightings, opt for wooded habitats and riparian zones or forest edges near agricultural areas that will support plenty of mice, voles and other prey for owls. Be sure to always respect the boundaries of private property, however, and obey all posted signs for closed preserves or parks. Keep Quiet: Owls have excellent hearing and will hear you, but the quieter you are, the less you will disturb and stress the birds. If they don't consider you a threat, they are less likely to fly away. Turn cell phones and other mobile devices off or mute ringtones, and be sure no gear or clothing is making any noise to disturb owls. Keep Your Distance: Many owls can be aggressive, particularly near their nesting areas. Once you spot an owl, stay as still as possible and avoid getting too close, which may alarm or stress the bird. Listen Carefully: Cupping your hands around your ears can help you better hear an owl's call. Moving around carefully as you listen can help you triangulate the bird's position, so you have a better chance of getting a good view. Careful listening can also help with identifying owls since many of these birds have distinct calls and call patterns. Look Closely: Owls have superb camouflage, and even when the bird is nearby it may be hard to see clearly. Study suspicious lumps or bumps on branches and watch for head movements or stretching wings that can show you where the bird is perched. Stay Safe: Always be mindful of birding safety, particularly when birding at night. Stay on trails and be aware and respectful of other nocturnal wildlife you may encounter. Avoid any unsafe areas, and respect closed parks and preserves as well as private property. Minimize Lights: While you may need to use a flashlight to see a trail, avoid waving the light around to spot an owl. Try to keep lights pointed down, as a direct flash of light may disrupt the bird's night vision and make it more alarmed and vulnerable. If necessary, shine the light on a nearby branch and only use diffused light on the bird. Similarly, avoid flash photography when owling. Strapping a thin cloth, such as a tissue or handkerchief, over a bright flashlight can help dull the light to be less disturbing without being too dark to see. Minimize Recordings: Recordings of owl calls or the squeaks of prey may attract an owl into a position for a better view, but at a heavy cost. The birds are responding to what they believe to be a potential mate, competitor or meal, and in doing so, they are neglecting the necessary activities for survival – brooding eggs, preening, hunting, etc. This can stress and distract the birds, and any recordings should be used only minimally and discontinued immediately if birds are stressed. If you have trouble finding owls, contact local wildlife refuges, birding festivals or birding organizations to learn about any scheduled owling walks. Often led by an expert birder familiar with finding local owls, these events can be a great introduction to owls in the wild. For even more owls right at home, consider attracting owls to your backyard to bring owling right to your back door. How Do Birds See Color?